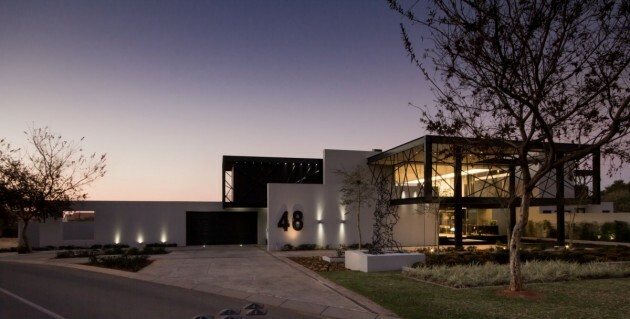 Nico van der Meulen Architects have completed the Ber house in Midrand, South Africa. 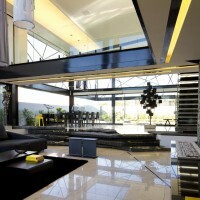 The clients requested a contemporary, iconic house without unnecessary rooms, open plan and airy. 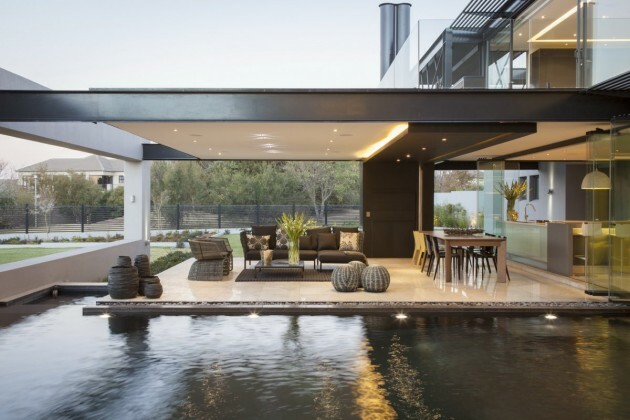 They needed four suites, a living area and a large study. 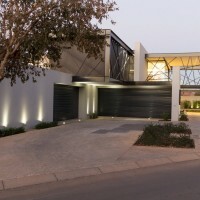 Originally they wanted burglar bars, but these fixtures are not allowed in the estate, and this was the inspiration for the random steel bars used around the house. 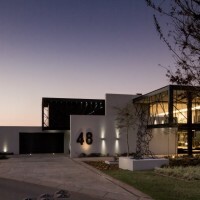 Werner van der Meulen of Nico van der Meulen Architects designed the house as a simple rectangular shape with the living rooms in the centre and surrounded by a koi pond and pool. From the porte cochere one walks over the koi pond to the front door, through the hall, dining room and family room to the pool on the north side. 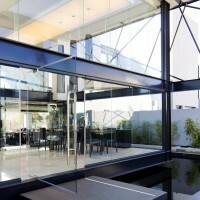 The koi pond filled with mature koi surrounds the dining room on two sides. 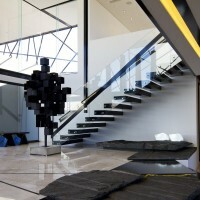 Broken slabs of granite with steel sheets functions as steps between the dining room , hall, family room and kitchen. 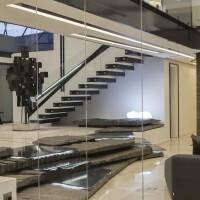 A cantilevered staircase juts out of a granite clad wall with the illuminated handrail cut into the wall. 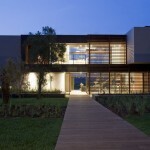 The kitchen is enclosed with frame-less doors which opens up to the lanai area that faces the garden on the east. A steel grating balcony at the main bathroom on the north-east corner protects the kitchen from too much morning sun. The study faces north/east, with the east side facing the lanai across the pool. 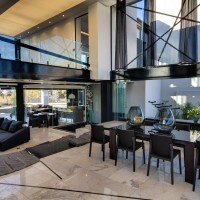 A bridge crosses over the living room and connects the pyjama lounge and children’s bedrooms with the main suite. M Square Lifestyle Design selected the random patterns evident on the steel facade as inspiration for the interior design. Illuminated ceilings add to the feeling of transparency, while the materials used were chosen to compliment the contemporary atmosphere. B&B Italia, Pedrali and Molteni & C furniture, Foscarini and Zero lamps and Ligne Pure rugs were supplied by M Square Lifestyle Necessities, along with steel sculptures by Regardt van der Meulen.